Every dog breed, or more specifically every dog, as individual, has different eating habits. Some dogs are picky eaters, while some eat voraciously. Additionally there is a plethora of brands, placing different types of food on the shelves of your local pet store. Each brand uses different wordings and marketing claims. Therefore choosing the right food can be an overwhelming, time-consuming and challenging task. Although the ultimate decision is based on the dog’s personal taste preference, few important factors must be taken into consideration. Those factors include age, breed, body composition, gender, whether neutered or not, temperament, activity level and last but not least – health status. Since these factors influence the nutritional needs of your dog, it is important to consider them when choosing your dog's food. The perfect food contains proper ratios of the six major nutrients – proteins, carbohydrates, fats & oils, vitamins, minerals and water. However, the food can be defined as complete/balanced, only if it contains all necessary nutrients for your dog’s growth and if it can be used as sole source of nutrition. If you use complete/balanced nutrition, you do not need to worry about deficiencies, unless your dog has specific issues that require special diet or supplements. Addressing health concerns with corresponding diets, increases your dog’s quality of life and extends its survival period. One of those special diets is the low fat diet. Low fat diets are specifically formulated to keep the calorie count low while maintaining the satiety high. Although low fat diets are prescribed to dogs suffering from certain health conditions, they are mostly popular among dog owners who want to help their dogs fight obesity or maintain healthy weight after losing few pounds. It is estimated that over 35 million American dogs are overweight, which is a whopping 45% of the entire population. 1. Choose a proven brand – trusted brands enjoy good impression among buyers. The best option would be to go for a proven brand even if it breaks down your saving account. 2. Choose quality over quantity – it is worth investing in a higher quality dog food. Premium, super premium and ultra premium dog foods tend to use better quality ingredients. and contain 40-60% proteins, while less expensive options contain only 10-20% proteins. Cheaper dog food brands feature fillers and cheap ingredients to bulk out the food. Avoid brands that use by-products of any type, artificial preservatives, flavors and colors, harmful fillers, regular or processed vegetable oils and trimmings of fat. Higher protein levels help your dog feel satiated, while eating less. Low fat content is important, but low calorie intake is even more important. Lean dry dog foods should have less than 9% of fat content and wet foods should have less than 4% of fat content. Low fat diets should have no more than 400 kcal/cup caloric content. If buying in bulk, make sure the diet has less than 3.100 kcal/kg for dry food and less than 900 kcal/kg for wet food. 4. Choose highly palatable food – you can buy the most expensive, organic, human-grade food, but if your dog does not like how it tastes, the formula is worth nothing. Therefore, always keep in mind that your dog must approve of the food. Take him to the pet center and let him try several foods or ask for food samples, before buying a big bag. 5. Choose the right form of the food – low fat dog food comes in both cans and kibbles. It is no secret that if offered a choice, most dogs will go for the canned version of the food. After all moist food does smell and taste better. On the flip side, kibbles are cheaper, simpler to use and easier to store. More often than not, kibbles are healthier and more nutritious, since they contain less preservatives, when compared to cans. Cans also contain more animal derivatives. 6. Choose the best flavor – always pick the flavor your dog wants, knows and easily digests. In some cases introducing novel protein source is a good choice, especially when dealing with allergic and sensitive dogs. However when fed with new protein sources, some dogs may experience irregular bowel movements and gastric pain. In a nutshell, when deciding on flavor there are three considerations: whether your dog likes it or not, how easily it can be digested and what benefits it has. Popular and common flavors in low fat foods are chicken and fish. 7. Choose age appropriate foods – buy puppy food for puppies, adult dog food for adult dogs and senior dog food for senior dogs. Each age group has different nutritional needs which can be addressed only if fed an appropriate diet. Specific developmental stages seek specific nutrients. So get your dog a diet that is specifically formulated for its life stage. 8. Check the Guaranteed Analysis Comparison, the Regulator Seal and the Feeding Amounts stated on the package. 9. Seek professional opinion – if you cannot take your dog to a dog nutritionist, consult with your vet or at least talk to the salesperson at the local pet center. Just do not decide anything on your own. Putting your dog on a low fat diet, must be medically supported and sustained. Therapeutic diets are specifically designed and should not be fed to healthy dogs with proper body weights. 10. Switch different foods gradually – once you bought new food you must safely handle the diet transition. It is highly advised to switch foods slowly over 7 to 10 days. Start by mixing small amounts of the new food with the old food and gradually increase its portion until the entire meal consists of the new food. Since all those criteria might be overwhelming, especially for first time dog parents, to make things simple and easy, we have compiled a list of the 10 best low fat foods for dogs, available on Amazon. CORE recipes are formulated based on the nutritional philosophy that dogs, just like their wild ancestors, should thrive on a natural diet comprised of meat. Containing 25% less fat, CORE Reduced Fat is one of the best low fat foods for dogs 1 year old and above. Additionally, the formula is grain-free. 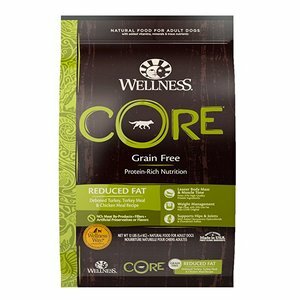 CORE Reduced Fat contains meat from deboned turkey and chicken, as well as turkey and chicken meal, whitefish meal and chicken liver. It also features a proprietary blend of fruits, vegetables, oils and botanicals that nurture your dog to the core. In a nutshell the first five ingredients are turkey, turkey meal, chicken meal, potato and peas. Turkey is excellent source of high-quality protein and fatty acids. Potatoes are a gluten-free carbohydrate source and peas are rich in natural fiber. Chicken liver is rich source of vitamins A, D and B. Carrots are source of beta-carotene, which prevents eye problems and cardiovascular diseases. Omega 3 and Omega 6 fatty acids from salmon oil and flaxseeds nutritionally support healthy skin. Glucosamine and chondroitin help to support long term bone and joint health. The formula does not contain grains and fillers. CORE Reduced Fat contains 35% less carbohydrates than traditional weight control diets. The caloric content of the food is 350 kcal/cup. Blue Buffalo is a quite new pet food company that produces healthy, premium foods, with high-quality, natural ingredients. Blue Buffalo’s Healthy Weight Adult Chicken & Brown Rice has a very low fat content and is perfect for helping dogs achieve and maintain healthy body weight. 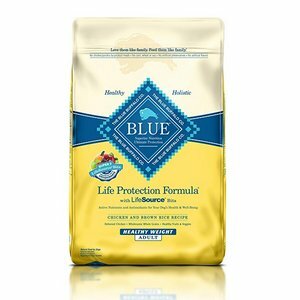 The Blue Life Protection Formula contains real meat, whole grains, garden vegetables, fruits and additional so called LifeSource Bits. LifeSource Bits are Blue Food’s exclusive blend of nutrients – vitamins and minerals, fortified with antioxidant rich ingredients. The first five ingredients of the diet include deboned chicken, brown rice, barley, oatmeal and chicken meal. Chicken as first ingredient offers real, palatable taste and provides many essential amino acids. Brown rice, barley and oats are energy providing, whole grains. All in all, the formula contains high-quality protein and added L-carnitine, important for lean muscular development. The caloric content of the food is 3.271 kcal/kg or 322 kcal/cup. Honest Kitchen brand, makes wholesome, all natural foods, by using innovative processing technique – gentle dehydration (which leaves the ingredients intact). Honest Kitchen’s delicious and nutritious meals are made with real, healthy and human-grade ingredients. The meals are easy to prepare and serve at home. You only need to add warm water and stir well, to rehydrate the product. The Honest Kitchen’s foods perfectly combine the benefits of a biologically appropriate raw food with the convenience and simplicity of a balanced, already-blended product. 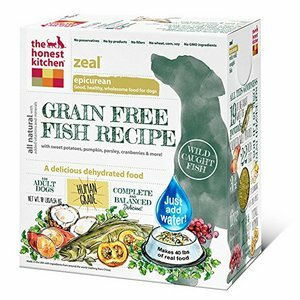 The Honest Kitchen Zeal Grain-Free Dehydrated Dog Food – fish recipe, is a delicious food, specifically formulated for sensitive adult dogs. The formula’s main ingredients are Marine Stewardship Council-certified, wild caught, ethoxyquine-free white fish and antioxidant-rich produce, including the Pacific cod and Pollock caught off the coast of Alaska. Beside fish, the diet includes eggs, fruits (coconut, apples, bananas and cranberries), vegetables (sweet potatoes, green beans, parsley, cabbage and garlic) and vitamin and mineral supplements. Additionally, the food is free of common allergens such as grain, gluten, flaxseed and potatoes. The caloric content of the food is 3.800 kcal/kg or 437 kcal/cup. The formula is low in calorie and in fat, but high in proteins, which makes her the perfect maintenance diet for adult and senior dogs of all breeds and sizes. It is specifically indicated for sensitive dogs, allergic to common proteins. In collaboration with veterinarians and dog trainers, Eagle Pack was founded in 1985. It manufactures super premium dog foods, sold in exclusive pet shops. Eagle Pack Reduced Fat Formula offers the right balance of proteins, fats and carbohydrates. The diet is fortified with health-promoting antioxidants, omega fatty acids and healthy supplements for weight loss support. The formula is specifically indicated for less active or overweight dogs. The first five ingredients of the formula include ground yellow corn, ground brown rice, pork meal, oatmeal and dried beet pulp. Corn is a problematic ingredient, commonly linked with allergies in dogs. Brown rice is easily digestible, complex, carbohydrate source. Pork meal is protein rich, meat concentrate. Oatmeal is a gluten-free, whole-grain packed with vitamin B and fiber. Beet pulp is quite controversial ingredient since some data show it has health benefits, while other data state it is inexpensive filler. 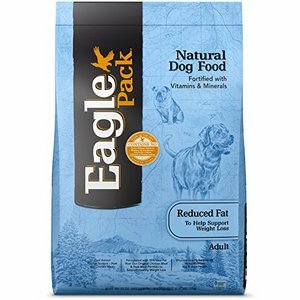 In a nutshell, Eagle Pack Natural Dry Dog Food Reduced Fat is a grain-based formula with modest amount of animal protein sources. The diet includes glucosamine hydrochloride, important for healthy joints and is enriched with powerful vitamin and mineral blend. The caloric content of the food is 3.240 kcal/kg or 343 kcal/cup. Castor & Pollux produces all-natural, wholesome, nutritious and super premium pet foods. It is one of the top natural and organic pet food brands on the market. The company believes that in order to get the best out of your dog, first you have to put the best in. 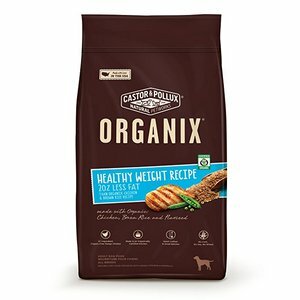 Castor & Pollux Organix Healthy Weight Recipe Dry Dog Food is a delicious formula, offering enhanced, complete and balanced nutrition, while maintaining healthy body weight. It is on of the best low fat diets for adult inactive and obese dogs. When compared to the classic Castor & Pollux formula, this diet contains 20% less fat. The first five ingredients include organic, range-free chicken, organic chicken meal, organic peas, organic barley and organic brown rice. Extra nutrition is ensured by adding organic flaxseed, blueberries and coconut oil to the formula. The extra nutrients support healthy skin and coat. The organic vegetables provide natural fiber, important for maintaining healthy intestinal tract and satiety feeling. The caloric content of the food is 3.565 kcal/kg or 357 kcal/cup. Weruva is an exclusive line of all-natural, grain-free, luxury pet food products. The company is a firm believer that pets are part of the family. 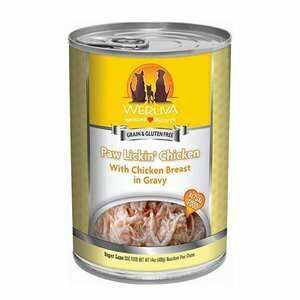 Weruva follows the tag-line ,,people food for pets’’. Weruva’s ingredients maintain a natural look and recognizable texture. Weruva’s Paw Lickin’Chicken is made of one, simple and wholesome ingredient – boneless and skinless, white chicken breasts. The chickens are raised cage-free, antibiotics-free and hormones-free. The chicken meat is shredded and dipped in a smooth, flavorful, carrageenan-free, jelly-like gravy. The chicken meat is an exceptional omega-3 and omega-6 source. The caloric content of the food is 268 kcal/14 oz can or 104 kcal/5.5 oz can. The formula is designed for adult dog maintenance and is one of the best grain-free, low fat dog foods available. 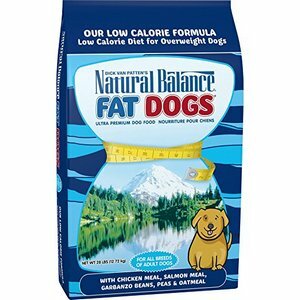 Natural Balance Fat Dogs Low Calorie Dry Dog Formula is formulated specifically for overweight adult dogs. The diet is formulated to keep dogs nutritionally balanced while consuming less calories. The formula contains special protein and fiber blend that helps your dog feel full. This food is one of the lowest calorie diets on the market. Natural Balance Fat Dogs Dry Dog Food includes meat meals, healthy veggies, vitamin supplements and essential minerals that support your dog's overall wellbeing. Featuring a special blend of premium meat proteins, the diet helps dogs maintain lean muscle mass as they lose weight. Besides being high in proteins, the diet is high in fibers too, which helps your dog feel satiated while eating less. The first five ingredients include chicken meal, salmon meal, chickpea, dried peas and pearled barley. Chicken and salmon meals are considered meat concentrates and are extremely rich with proteins. Chickpea is nutritious, fiber-rich legume. Dried peas are a fiber rich, carbohydrate source and barley is a starchy carbohydrate. The caloric content of the food is 3.025 kcal/kg or 250 kcal/cup. 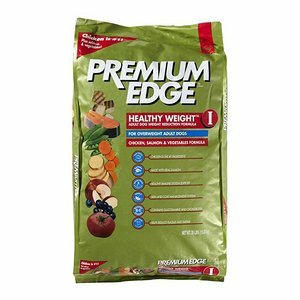 Premium Edge Healthy Weight I Weight Reduction Formula Adult is specifically designed for healthy, but overweight adult dogs. The formula promotes healthy weight levels, skin and coat health and strong immune system. It actually maintains healthy body weight, following weight loss. The five main ingredients of the diet are chicken, chicken meal, peas, fish meal and potatoes. Chicken is used as the primary protein source, while potatoes are used as primary carbohydrate source. The formula contains added L-carnitine to help promote fat burning, glucosamine and chondroitin for healthy joints and antioxidants to promote overall good health. Omega fatty acids from flaxseeds and salmon meal provide optimal skin and coat health, while probiotics and digestive enzymes promote a healthy GI tract. The food is rich with natural antioxidants from fruits and vegetables. Additionally, the formula does not contain common allergens. The caloric content of the food is 3.500 kcal/kg or 347 kcal/cup. Natural Balance creates healthy, all-natural, complete and balanced, ultra premium meals for dogs and cats, since 1989. All Natural Balance’s formulas are based on sound nutritional science. 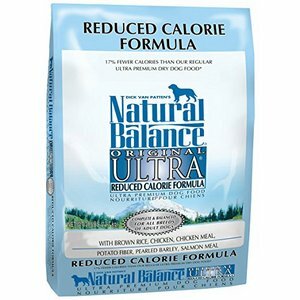 Natural Balance Original Ultra Reduced Calorie Formula is indicated for senior dogs, adult overweigh dogs and dogs with sedentary lifestyles. The diet contains 17% less calories than the Natural Balance’s standard formula. The first five ingredients are brown rice, chicken, chicken meal, potato fiber and rice bran. Brown rice is easily digestible carbohydrate that contains high amounts of B vitamins. Potato fiber, as dietary fiber source, helps stabilize blood sugar levels and reduces the dog’s caloric intake. Potatoes are also rich in potassium. Rice bran is a healthy, fiber-rich, rice by-product, packed with protein, fat, vitamins and minerals. The added carrots help maintain good vision, while the essential fatty acids promote healthy skin and coat. The diet also contains oatmeal. Oatmeal is extraordinary carbohydrate source, rich in fiber, thiamine and vitamin E. The caloric content of the food is 3.337 kcal/kg or 330 kcal/cup. Royal Canin Gastrointestinal Low Fat Canned Dog Food is a specific nutrient blend developed by nutritionists and veterinarians. It is specifically formulated for reducing acute intestinal absorption disorders and promoting nutritional restoration as well as convalescence. Royal Canin Gastrointestinal Low Fat Canned Dog Food is indicated for dogs suffering from acute and chronic pancreatitis, acute and chronic diarrhea, hyperlipidemia, lymphangietctasia, oxidative enteropathy, exocrine pancreatic insufficiency, bacterial overgrowth and bile acid deficiency. It is also suitable for dogs that need to lose weight or maintain healthy weight. The first 5 ingredients of the formula are: water sufficient for processing, pork by-products, rice flour, corn grits and corn meal. The formula contains easily digestible, high-quality proteins that can be readily absorbed by the dog’s digestive system. The fact that it is low in fiber, adds to the easy digestibility. The diet includes hydrolyzed yeast, fructooligosaccharides and zeolite, which nourish the intestinal tissue and microflora. It also has important vitamins and minerals to help reestablish natural balance in the gastrointestinal system, while building strong environmental defenses. 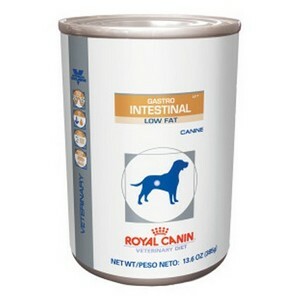 Royal Canine Gastrointestinal also helps maintain healthy weight.